Taking a closer look has a double-meaning when a telescope is the object of our gaze. This one, with a mahogany wood barrel and brass fittings for glass lenses, is a special treasure in the Winterthur collection. It seems enormous by today’s standards for personal telescopes— about 50 inches long— and although not heavy, is awkward to hold steady at your eye. The barrel’s exterior has 10 faceted, tapering sides, and it may be mounted on a tripod stand. Two brass straps encircling the case near the end were added sometime later to stabilize a few long cracks in the mahogany. Telescope, 1760‒80; mahogany, brass, glass. Made by Dollond, London, England. Winterthur Museum, Bequest of Henry Francis du Pont, 1961.1488. 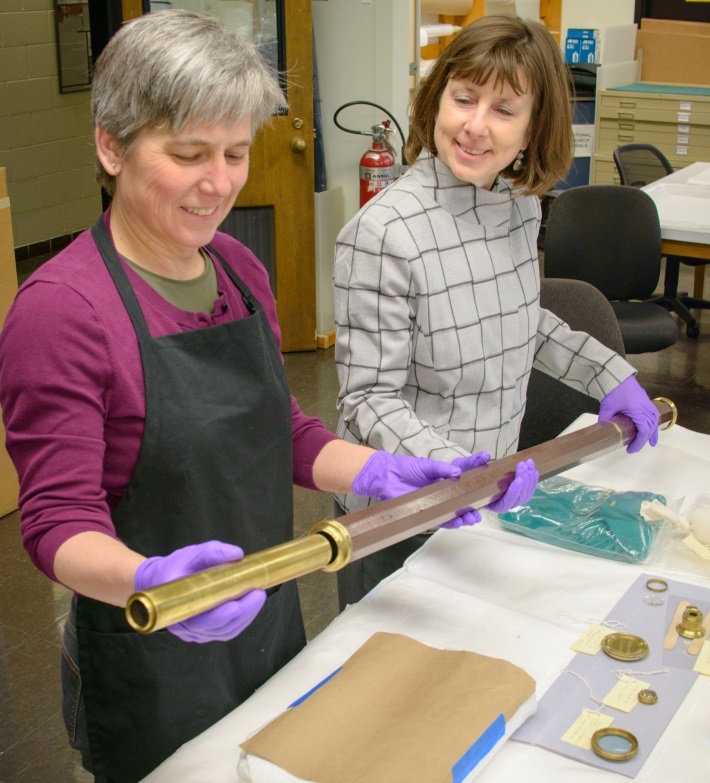 The Museum of the American Revolution, opening April 19, asked Winterthur to lend a historically significant telescope, so we scheduled a light cleaning session with conservator Linda Lennon. As we worked together, I became eager to share its hidden elements and history as well as a few photos taken during the process. You can see Linda demonstrating how the brass tube fits inside the mahogany case (eyepiece already removed). Telescope was the favored name for this instrument within the international science community, but spyglass was also in common use among English-speaking mariners. The “Capt. Du Pont” was Samuel F. DuPont (1803–1865), a relative of Winterthur Museum’s founder H. F. du Pont, which helps explain why I found this telescope tucked into the corner of a bedroom floor in the Winterthur house beneath a portrait of John Paul Jones (1747–1792). 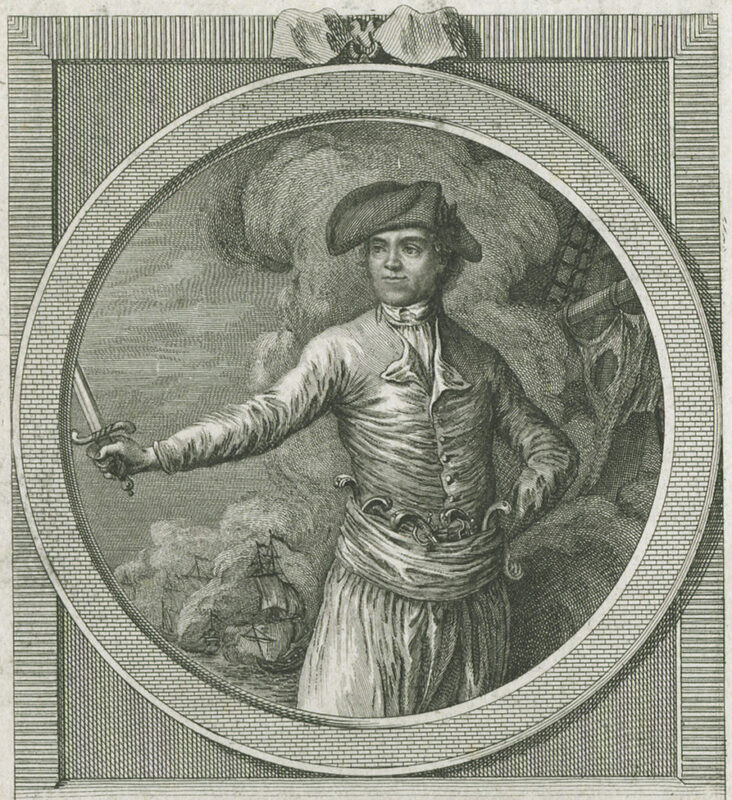 Jones, a Scottish-born merchant and captain, immigrated to North America when it was still a British colony, but he became a fierce adversary at sea. In 1776 Jones directed his mastery of maritime arts and warfare tactics to lead the emerging American navy. Today Jones retains the reputation of a daring and dauntless Revolutionary War naval commander, a reputation bolstered by ample historical fact and patriotic nostalgia. Jones’s history makes the telescope a notable artifact, but the most recent owner also achieved fame during his lifetime. Samuel F. DuPont rose within the ranks of the young navy that Jones helped build, ultimately becoming a Rear Admiral during the Civil War. Today he is nationally remembered at DuPont Circle in Washington, D.C. The inscribed date of 1851 may be in recognition of his military service off the coast of California during the Mexican-American War as well as his work to professionalize the U.S. Navy. Paul Jones’s life lamentably ended at age 45, while he lived in Paris. I am still searching for a direct link for this telescope to the Philadelphia merchant John Ross sometime before Jones died. I suspect that just before Ross’s son-in-law placed the telescope into DuPont’s hands, the barrel was repaired, and the brass spyglass given a serious polishing for the engraved dedication, which still looks fresh today. My new research identifies the third stellar name on this telescope. The stamp of a maker, “DOLLOND” appears just above the shop’s location, London, on the telescope’s original sliding lens cover. In the 1760–80s, when the telescope was made, Peter Dollond and his brother John Dollond, Jr., began running their father’s business specializing in scientific instruments. Their father, John, an innovator in optics, received an important 1758 patent for achromatic lenses used in refracting telescopes. The Dollond firm became known for superior lenses and produced a range of telescopes for British customers as well as for international scientific and military needs. Peter Dollond participated in the American Philosophical Society (Philadelphia), and the society received an achromatic telescope as a gift from another member in 1784. A few early Americans sought these costly instruments—Thomas Jefferson owned two. I found a newspaper announcement from 1810 announcing that one of Dollond’s large achromatic telescopes had arrived for use at the University of Pennsylvania. Jones’s telescope was still a valued instrument in 1851 but unlikely to have been used by Admiral DuPont. This photo pictures the inner brass spyglass. It seems that all the original lenses and components are still intact, although one cracked glass had to be stabilized. In the next photo you can see that the brazed seams in the tube above are actually three separate segments that draw apart further and encase a smaller lens tube. All of the spyglass parts and threaded brass rings to hold each lens in place are shown here. It’s not every day that we get to dismantle an historic instrument, so Linda took great care tracking which lens fit each bezel. After this telescope is cleaned and the case is lightly waxed, it will be reassembled for an exhibition where it will represent the best optical technology available to the American Navy during the War for Independence. It is in pretty splendid condition considering it was used at sea and on land about 250 years ago. Today, we can search on a website dedicated to marine traffic to discover a ship’s homeport and cargo, but this instrument’s carefully ground lenses and their proportionate design brought a distant ship or horizon into clearer sight. By Ann Wagner, Curator of Decorative Arts, Winterthur, with special thanks to Winterthur conservators Linda Lennon and Bruno Pouliot and photographer Jim Schneck. This entry was posted in Academic Programs, antiques, Art Conservation, Behind-the-Scenes, Decorative Arts, Du Pont Family, museum collection, Uncategorized and tagged antiques, Henry Francis du Pont, museum of the american revolution, samuel dupont, telescope, Winterthur Museum Garden & Library. Bookmark the permalink.